Tanoak is a unique evergreen hardwood that belongs to the beech family (Fagaceae). It has characteristics similar to both oak and chestnut. All other 100 to 200 species of Lithocarpus are native to southeast Asia or Malaysia. In southwestern Oregon, tanoak is second to Pacific madrone as the most abundant hardwood. Mature tanoak trees typically attain heights of 50 to 150 ft (208 ft maximum) and diameters of 6 to 48 in. (109 in. maximum). Tanoaks may live at least 250 years, although age can be difficult to determine. In dense forest stands, tanoaks develop narrow crowns with ascending branches on single, straight stems that are clear for 30 to 80 ft. In open stands, tanoaks often have broad crowns with large horizontal branches on short, forked boles. The root system of tanoak is composed of both deep and extensive lateral roots. Tanoak is native to a relatively narrow range on the West Coast from Santa Barbara, California, to Reedsport, Oregon (lat 34 to 43° N). It is most common in the Coast ranges and Siskiyou Mountains in California and southwestern Oregon, and can also be found in the Sierra Nevada. Growing stock volume in southwestern Oregon is about 350 MMCF (Appendix 1, Table 1), much of it on federal lands (269 MMCF). The inventory in California is 1938 MMCF; this considerably larger volume has supported better market development in California than in Oregon. Tanoak is very tolerant, and it commonly occurs in any crown position. Seedlings and saplings are quite common in the understory of hardwood or conifer stands. Understory tanoak can grow rapidly in response to death or removal of overstory trees. Tanoak of any age seem to prefer some shading from codominant stems within clumps. Sudden, excessive exposure of stems or crowns is detrimental. Tanoak typically occurs as a codominant tree with other hardwoods, often with an overstory of conifers. Pure stands of tanoak are also common during early stages of succession after fire or logging, however. Tanoak is a persistent, versatile species capable of maintaining a substantial component at any successional stage in many forest types. While tanoak is considered to be a climax species capable of reproducing in undisturbed forests, it is also well-adapted to disturbance. It sprouts vigorously after fire or cutting and often dominates large areas. Fire is the most important factor determining the fate of individual tanoaks and the abundance of the species in general. Fire often kills tanoak stems, although non-fatal injury may be more common. Stands with a substantial component of tanoak may be less flammable than stands of pure conifers. Tanoak is the most important hardwood species in the Mixed-Evergreen Zone of vegetation. The most common associate trees are Douglas-fir, Pacific madrone, and redwood. Other common associates are giant chinkapin, canyon live oak, California black oak, California-laurel, white fir, ponderosa pine, western hemlock, and Sitka spruce. Shrubs commonly associated with tanoak include blueblossom, hazel, evergreen huckleberry, salal, Pacific rhododendron, Oregon-grape, western poison- oak, red-flowered currant, and thimbleberry. Important herbaceous associates include western bracken, western swordfern, New Zealand fireweed, bull thistle, western whipplea, California brome, California fescue, and California sweetgrass. Continuing diameter growth on mature trees. Tanoak thrives in a mild, humid climate characterized by dry summers and wet winters, where snow is infrequent and ephemeral. In this climate, annual precipitation ranges from 40 to 140 in., typically with less than 5 percent falling from June through September. Mean daily temperatures range from a minimum of 36 to 42° F in January to a maximum of 60 to 74° F in July. Tanoak's large, deep root system and sclerophylous leaves impart some resistance to heat and drought. Compared to other sclerophylls (plants with thick, shiny blue-green leaves), however, tanoak requires more moderate temperatures and high levels of moisture; it shows little control over stomatal water loss. Tanoak grows best close to the coast where rain and fog, high humidity, and low clouds are plentiful. It prefers shade and dense foliage, which indicates a relatively high sensitivity to heat or sunlight. Mature tanoaks often decline in vigor when codominant neighbors are removed, causing sudden increases in exposure. Severe cold is rare in the natural range of tanoak. Significant dieback of foliage has been observed after a hard freeze. Heavy snow or ice may bend saplings to the ground and cause sprouts to break at their connection to the stump. Sound, undamaged tanoaks are windfirm. At the southern limit of its range, tanoak grows at 2400 to 4700 ft elevation on the coast and up to 6500 feet in the Sierra Nevada. It is most abundant from 500 to 3000 ft in the central and northern part of its range. Tanoak grows best on deep, well-drained, sandy, or gravelly loams, which may be derived from a variety of parent materials. The most productive soils for Douglas-fir or redwood are also some of the best soils for tanoak. It seldom thrives on heavy clay soils. Tanoak is also common on shallow, stony soils, usually on north slopes. It will not tolerate poor soil drainage or flooding. Sprouts as young as 5 years old may produce seed. Abundant seed production generally begins after 30 to 40 years. Most tanoaks bloom during the summer months, although some flowering may occur in the spring or fall. Separate male and female flowers are borne on the same plant. Most flowers of both sexes grow from the axils of new leaves on the current year’s shoot. The flowers are borne in dense, yellowish blossoms composed of clusters of female flowers at the base of erect male catkins (2 to 4 in. long). Seed ripens in the second autumn after pollination. A tanoak seed is similar to an oak acorn, about 0.75 in. long with a shallow, hairy cup. There are about 110 acorns/lb. Tanoak seed may be collected from late September to mid-November. Early acorns are often infested with insects; later acorns are generally sound, especially in a mast (high seed production) year. Acorns should be collected soon after they fall to reduce losses in viability from exposure to heat or drying. Germination and seedling emergence usually occur in spring. Acorns should be planted immediately or stored under cool, moist conditions (33 to 34° F) until spring planting. Estimates of germination rate vary from 19 to 80 percent. Acorns should be planted with the pointed end up. Natural reproduction of tanoak from seed is often quite abundant. The best conditions for seedling establishment occur in undisturbed duff and litter under partial to full forest cover. There, regeneration occurs as a steady accumulation over long periods of time. Although acorns germinate under other conditions, their survival is poor in clearcuts and heavily disturbed environments. Even under good conditions, only a small percentage of seeds become established seedlings. Regeneration is successful because tanoaks produce large amounts of seed. Mature trees may produce as many as 110,000 seeds per year. Tanoaks generally produce some seeds every year and usually bear heavy crops of acorns every two years. The low percentage of acorns that become established seedlings is primarily due to predation by insects, birds, rodents, deer, bears, and raccoons. Predation is particularly high in clearcuts and exposed areas. Tanoak produces vigorous basal sprouts under a variety of conditions. Sprouting is most vigorous after fire or cutting. Sprouts usually originate from belowground burls, which are characteristic of tanoak of any size. To promote development of better quality sprouts, stumps should be cut low to the ground. Very little effort has been made to regenerate tanoak with planted seedlings. Seedlings established from broadcast seeds have performed poorly, particularly in well-prepared sites under open conditions that are successful for plantations of other hardwoods. Better results may be possible with the outplanting of vigorous nursery stock, as demonstrated for some true oaks. In comparison to sprout regeneration, however, seedlings have lower rates of survival and growth. Little site preparation is necessary for establishing stands of sprout origin. Regeneration and growth are enhanced by burning or mechanically removing slash that shades tanoak stumps. Pre-established roots and rapid growth of sprout clumps make tanoak a superior competitor in the new stand. With high densities of parent stumps, rapid development of tanoak cover will inhibit establishment and growth of competing species. At lower densities of tanoak, control of competing herbs and shrubs can improve the growth of young tanoak sprouts. Site-preparation treatments that leave intact litter and partial protection (debris, vegetation) may be best for promoting establishment and growth of tanoak seedlings. Tanoak sprouts initiate at very high densities (up to 500 per parent), after which self-thinning and expression of dominance proceed rapidly. Thinning young sprout clumps at 3 to 10 years is not effective because of the abundant resprouts. Thinning may improve growth and quality in older stands of tanoak. Density should not be reduced below about 100 ft2 per acre of basal area. To avoid excessive exposure of residuals, thinning should be done in small steps of about 25 ft2/acre at 3-to-5-year intervals, if necessary. Thinning should leave well-formed, dominant stems that originate from the ground. Companion sprouts with “V”-type connections should be left intact or cut as a unit. Tanoak can grow in any crown position in stands with mixed species or age classes. Management of mixed stands is complex, however, and will require aggressive control of tanoak to maintain diverse components of hardwoods and conifers, which are generally less tolerant of shade. Tanoaks grow very slowly in dense shade, but understory saplings respond quickly to increased light. Larger, codominant trees may decline if stands are opened too much. Seedlings grow slowly, generally averaging 2 to 8 in. in annual height growth during the first 5 years. Sprouts may grow up to 5 ft in the first year, and average 2 ft per year for the first 15 to 20 years. Fully stocked tanoak stands of sprout origin rapidly accumulate basal area. On one good site, sprout basal area reached 100 ft2 per acre after 9 years. After 50 years or more, typical basal areas can range from 160 to 260 ft2 per acre. Typical stand volumes range from 2000 to 4000 ft3 per acre, with volumes as high as 7000 ft3 per acre occurring in small productive patches of up to several acres. The net annual growth of tanoak in California averages 3.5 percent of standing inventory, the highest rate of any hardwood in California. There has been very little management of tanoak stands. Average annual growth rates of 85 ft3 per acre were measured in 50-to-60-year-old tanoak stands after they were thinned to a basal area of 102 to 125 ft2 per acre on a high site in northern California. Unthinned stands on the same site had growth rates of 198 ft2 per acre. Tanoak acorns are an important food source for many animals, including birds, rodents, deer, bears, and raccoons. A component of tanoak provides thermal cover, refuge, and nesting habitat for wildlife. Northern flying squirrels, Allens’ chipmunks, and dusky-footed woodrats are closely associated with tanoak. Combined with an overstory of large conifers, a component of tanoak may improve habitat for northern spotted owls by providing canopy structure and habitat for prey such as woodrats and northern flying squirrels. Fungi commonly enter tanoak trunks that have been injured by fire. The combination of fire injury followed by fungal decay is frequent, producing a high incidence of defect in older trees. Common fungi that decay living trees include a brown cubical rot (the beefsteak fungus, Fistula hepatica), a white root rot, weeping conk (Inonotus dryadeus), and a sap rot (Schizophyllum commune). There are no known hybrids of tanoak. A shrub form of tanoak (Lithocarpus densiflorus var. echinoides) grows on moist sites at elevations higher than the tree form. Diameter at breast height and total height can be used with tables or equations to estimate total tree volume in cubic feet and sawlog volume. A recent study of tanoak lumber recovery found that, even though eastern hardwood grades will separate logs into distinct value classes, the impact of log diameter on lumber value is more important. Shifts in lumber values and competition with eastern hardwood species may make the use of log grades more important in the future. Sawlogs usually have a minimum small-end diameter of 6 to 10 in., smaller logs are generally chipped for pulp. If tanoak logs are not processed shortly after their removal from the woods, the lumber commonly end-splits. One study showed that the percentage recovery of No. 1 Common or Better green lumber from grade 1 tanoak logs is slightly lower than the recovery from eastern oaks. The lumber grade recovery from grade 2 and 3 logs compares favorably with the lumber grade recovery from eastern oaks and is higher than from the other hardwoods (Appendix 1, Table 2). Even high grade tanoak logs yielded a comparatively low percentage (29 percent) of Select or Better lumber, however. Tanoak has also been found to yield good quality veneer for furniture production. Heat treatment of the blocks to 160° F improved the smoothness, tightness, and quality of the veneer without increasing the amount of end splitting. Defects included surface checking and associated staining, and knots greater than 2 in. The interior cores produced veneer that was rough and buckled, so the cores should be left larger than normal. There were no problems drying the veneer. Tanoak is a hard, heavy wood that in many ways resembles the true oaks; thus, tanoak is often included in discussions about lumber from western oak species. The wood is a light, reddish-brown when freshly cut, but it ages to a tannish, reddish-brown. 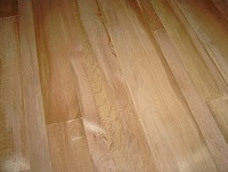 The sapwood is very wide; it is difficult to distinguish the heartwood from the sapwood. There is some opinion that true heartwood does not exist in this species. The growth rings are difficult to distinguish and are delineated only by a faint narrow line of darker, denser tissue at the outer margin. The infrequent pores are barely visible to the naked eye, are unevenly distributed, and are inserted in light-colored tissue in streamlike clusters that extend across several or many growth rings. As a result, the wood is evenly textured, with little apparent grain. There are broad rays, however, which are conspicuous and especially prominent on quartersawn surfaces. Narrow rays are also present, but require magnification to view. When dry, the wood has no characteristic odor or taste. Tanoak weighs about 62 lb/ft3 when green and 41 lb/ft3 at 11 percent moisture content (MC). The average specific gravity is 0.54 (green) or 0.66 (ovendry). The wood of tanoak is highly rated for its strength properties. It is noted for hardness, resistance to abrasion, stiffness, and bending strengths. It holds fasteners well, but requires preboring before nailing to prevent splitting. See Appendix 1, Table 3 for average mechanical properties for small clear specimens. Tanoak lumber requires special care and well-controlled conditions during drying to properly lower MC without causing excessive degrade. It is no more difficult to dry than some eastern or other West Coast oak species, however, unless it has mineral streak. Poor or uncontrolled drying will cause defects such as end and surface checking in the lumber. In addition, tanoak lumber can be degraded with honeycomb and collapse if the drying rate is too rapid. These problems increase when lumber with mineral streak is dried; in many cases, it is not worth the effort to dry mineral streak material. Tanoak can stain if certain metals contact the wet wood; contact with iron can produce a pronounced blue-black discoloration. Molds and bacterial stains will develop if air circulation around the wet lumber is inadequate. Proper air-drying of tanoak requires very mild conditions, with moderate temperatures and high humidities, to avoid developing molds and bacterial stains. Poor handling of green wood can also produce sap staining. Air-drying will minimize much of the drying degrade and will reduce the total kiln times as well. The green MC of tanoak is reported to be 115 percent (ovendry basis). Shrinkage values for green to ovendry lumber (based on the original green size) average 5.5 percent radially and 10 percent tangentially. See the table below for the appropriate kiln schedule. For information about schedules for thicker material or wood that is partially air-dried, contact the Department of Wood Science & Engineering at OSU. Tanoak’s machinability is comparable to or better than that of the oaks with regard to planing, shaping, boring, and mortising. As with the oaks, tanoak sands well with a minimum or scratching or fuzzing. Both tooling and sandpaper dull moderately quickly because of the hardness of the wood. For optimum planing results, the recommended hook angle is 15°. Machine burn is possible if feed speeds are too slow. If conditions are well controlled, tanoak produces glue joints of good strength. Tanoak finishes well because of its uniform color (between sapwood and heartwood) and evenly textured, fine-grained appearance. Transparent stains and dyes are better than pigmented stains in retaining more readable finishes on tanoak. Clear-coated flooring products made from tanoak have a warm, pleasant appearance. Tanoak is a non-durable species when subjected to conditions favorable to wood decay organisms. On average, round, unpeeled posts decay within 4 years of being placed in the ground. Tanoak can be effectively treated with wood preservatives. Tanoak is used for flooring, furniture, truck bedding, pallets, veneer, paneling, ties and mine timbers, pulpwood, and firewood. DICKINSON, F.E., and D.R. PRESTEMON. 1965. Tanoak log grades and lumber yield. California Agriculture Experiment Station, Berkeley, California. California Forestry and Forest Products No. 41. ESPENAS, L.D. 1953. The seasoning of one-inch tanoak lumber. Oregon Forest Products Laboratory, State Board of Forestry and School of Forestry, Corvallis, Oregon. Bulletin 3. 46 p.
HARRINGTON, T.B., R.J. PABST, and J.C. TAPPEINER II. 1994. Seasonal physiology of Douglas-fir saplings: response to microclimate in stands of tanoak or Pacific madrone. Forest Science 40:59-82. HARRINGTON, T.B., J.C. TAPPEINER II, and R. WARBINGTON. 1992. Predicting crown sizes and diameter distributions of tanoak, Pacific madrone, and giant chinkapin sprout clumps. Western Journal of Applied Forestry 7:103-108. McDONALD, P.M. 1983. Local volume tables for Pacific madrone, tanoak, and California black oak in north-central California. USDA Forest Service, Pacific Southwest Forest and Range Experiment Station, Berkeley, California. Research Note PSW-362. 6 p.
McDONALD, P.M. 1992. Estimating seed crops of conifer and hardwood species. Canadian Journal of Forest Research 22:832-838. McDONALD, P.M., D. MINORE, and T. ATZET. 1983. Southwestern Oregon-northern California hardwoods. P. 29-32 in Silvicultural Systems for the Major Forest Types of the United States. R. Burns, tech compil. USDA Forest Service, Washington, D.C. Agriculture Handbook 445. McDONALD, P.M., and J.C. TAPPEINER. 1987. Silviculture, ecology, and management of tanoak in northern California. P. 62-70 in Proceedings of the Symposium on Multiple-Use Management of California’s Hardwood Resources. T.R. Plumb and N.H. Pillsbury, tech. coords. USDA Forest Service, Pacific Southwest Forest and Range Experiment Station, Berkeley, California. General Technical Report PSW-100. RAPHAEL, M.G. 1987. Wildlife-tanoak associations in Douglas-fir forest of northwestern California. P. 183-189 in Proceedings of the symposium on Multiple-Use Management of California’s Hardwood Resources. T.R. Plumb and N.H. Pillsbury, tech. coords. USDA Forest Service, Pacific Southwest Forest and Range Experiment Station, Berkeley, California. General Technical Report PSW-100. SCHOWALTER, W.E. 1949. The suitability of tanoak (Lithocarpus densiflora) for the production of veneer. USDA Forest Service, Forest Products Laboratory, Madison, Wisconsin. Administrative report. 7 p. On file with: Timber Quality Research Team, Forestry Sciences Laboratory, Pacific Northwest Research Station, P.O. Box 3890, Portland, Oregon 97208-3890. TAPPEINER, J.C., II, P.M. McDONALD. 1984. Development of tanoak understories in conifer stands. Canadian Journal of Forest Research 14:271-277. TAPPEINER, J.C., II, P.M. McDONALD, and T.F. HUGHES. 1986. Survival of tanoak (Lithocarpus densiflorus) and Pacific madrone (Arbutus menziesii) seedlings in forests of southwestern Oregon. New Forests 1:43-55. TAPPEINER, J.C., II, P.M. McDONALD, and D.F. ROY. 1990. Tanoak. P. 417-425 in Silvics of North America. Volume 2, Hardwoods. R.M. Burns and B.H. Honkala, coords. USDA Forest Service, Washington D.C. Agriculture Handbook 654.